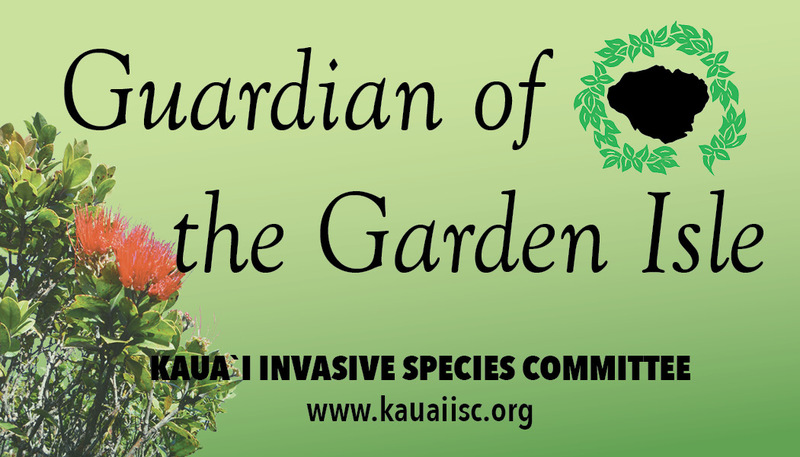 The Kauai Invasive Species Committee is funded entirely by grants and donations. 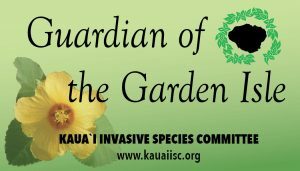 All donations will be directed toward continuing KISC’s work protecting the biodiversity and natural resources of Kauai. 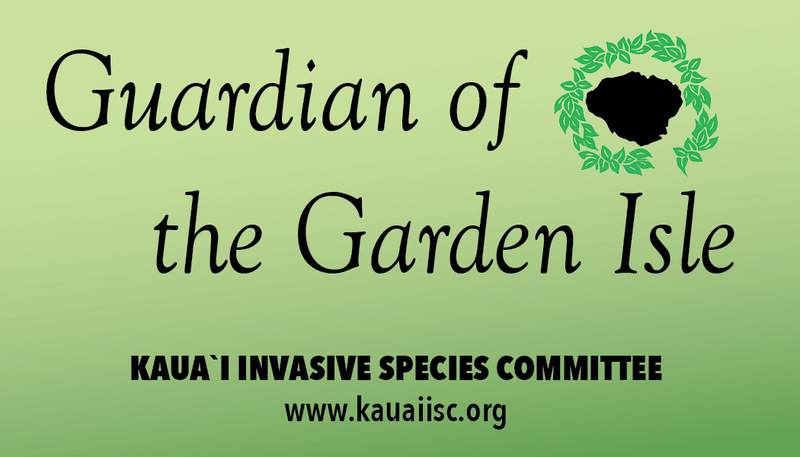 Become a Guardian of the Garden Isle! 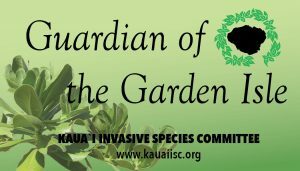 Guardians of the Garden Isle are concerned citizens of Kauai who have committed to help protect the island from invasive species. Choose a membership level and sign up. 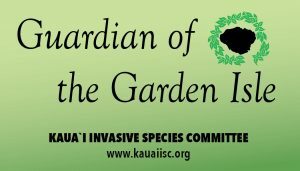 All memberships in the network come with a Guardian of the Garden Isle membership card (provide mailing address to receive). 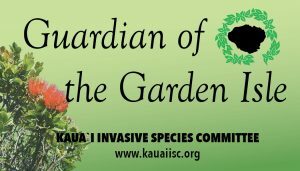 And with a donation, each membership comes with a complimentary Guardians of the Garden Isle gift! Join the Gaurdian of the Garden Isle network! Choose your level of membership and donation. If you would like to donate through PayPal, a nominal fee is deducted from the donation. PayPal donations are routed through Garden Island Resource Conservation and Development, Inc. a 501 c(3) non-profit. You may donate by Paypal. Checks can be mailed to KISC’s on-island nonprofit fiscal umbrella, Garden Island Resource Conservation and Development. Please make checks out to “Garden Island RC&D” and make a note that the donation is for KISC. A receipt will be mailed to you. If you donate by check (Checks made to: GIRC&D), be sure to still sign up for a membership! 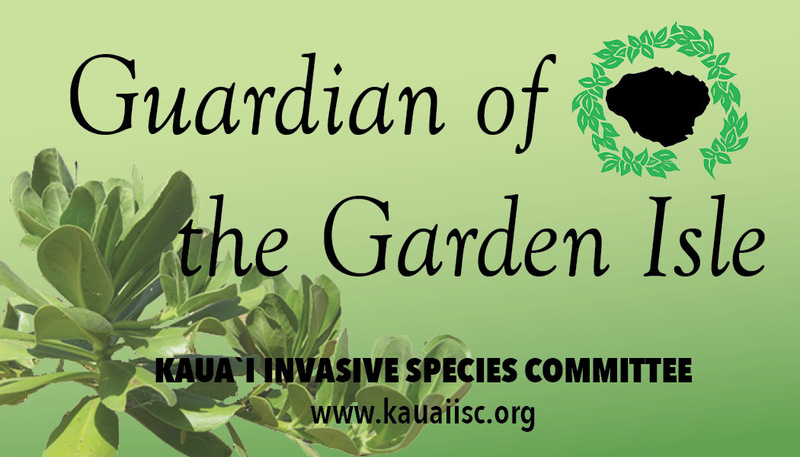 Once you secure the well being of your family and friends, you may choose to include in your will a significant donation to help preserve the unique biodiversity of Kauai by donating to KISC. If important changes occur in your life, you can always modify your will according to your situation. Contact a legal or financial advisor for more information and have them contact Garden Island Resource Conservation and Development, (a 501c3). 808-246-0006. Here are some actions you can take to become a Guardian of the Garden Isle! Clean or brush off your gear/shoes/dogs, after hiking or hunting in the forest. Cleaning you gear ensures that you will not track potentially invasive seeds or other pests to different parts of the island. Go native Choosing native plants for landscaping at your home or place of business helps keep the native ecosystem healthy, they provide food and habitat for native insects and birds, and are often easier to maintain that non-native plants! 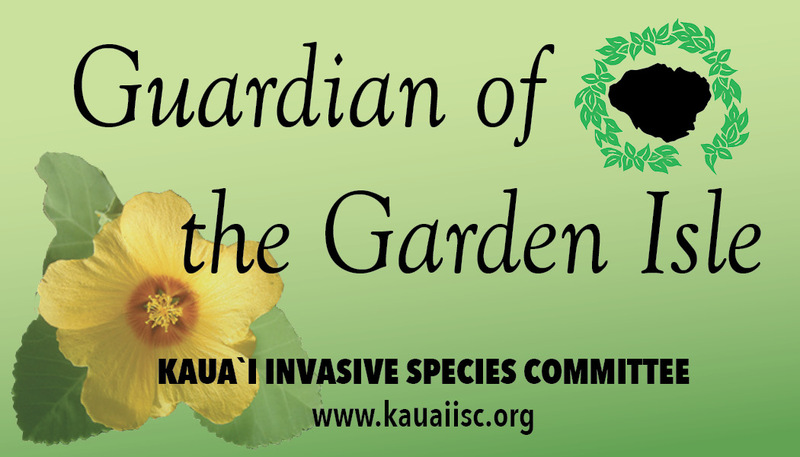 Plant Pono Replacing invasive plants in your yard with non-invasive plants helps stop the spread of invasive species. Invasive plants can easily spread from a backyard into a natural area or forest. Check out the Plant Pono website for good replacement plant ideas. And check out the KISC Pests page to learn what invasive plants KISC will remove for free from your yard! Buy Local Buying plants from nurseries who source locally or propagate on island, is key in protecting Kauai from invasive species that can easily hitch hike in plants from other islands. For example, Coqui Frogs, and Little Fire Ants are widespread in some nurseries on Big Island. Don’t be afraid to ask a nursery associate if the plants you are buying, were sourced locally. Stay informed There are many ways to stay current with invasive species news. Subscribe to our Blog, like us on Facebook, or follow us on Instagram. Join the Guardian of the Garden Isle network today!